Amelie wins the national round and £1000 for her school. Amelie Robinson, the Year 4 Chalfont St Peter pupil from Buckinghamshire, has won the national and final round of the JDP Sustainability in Schools competition. 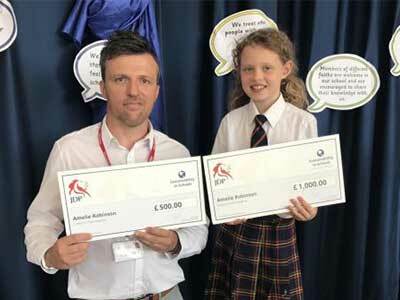 The nine-year-old won the Southern regional heat in June winning £500 for the school, and her entry has been chosen by JDP judges as the overall UK winner, beating over 1,000 pupils from 200 schools across the country. Head teacher Elizabeth Underwood said: “We are so proud of Amelie and her winning design. Martin Joyce, JDP Commercial Manager, commented how difficult it was to pick a winner out of the high-quality entries in this year’s competition. “The Sustainability in Schools initiative is a key part of the company’s outreach to promote the environment and healthy living, and the belief that every molecule counts – JDP’s unique attitude and mission for responsible business. “It was a very hard decision to pick an ultimate winner, as the standard of work from all the children was very high, but Amelie’s really stood out for the judges. She is a worthy winner of the national prize for her school. For more information about the JDP schools programme, please contact us.